Left: One of the three ornamental (but also useful) park shelters. Right: The new bandstand, in exactly the same spot as the original. Though different from the older one in style, its dome echoes that of the United Reformed Church nearby. Note that another of the shelters can be seen on the left here, at the other end of the promenade. The rules were rather strict, and it might seem all too appropriate that Salt selected William Gay to design it. Gay, one of the finest landscapers in the north, is best known for his cemeteries, including Undercliffe Cemetery, Bradford (established 1854), and Toxteth Park Cemetery, Liverpool (opened 1856). However, Salt was also responsible for a number of public parks (see "The Register of Parks and Gardens," 18), and there was plenty to enhance local life here. Typical of his work were long promenades with views, terraces, winding paths, and a strong central focus (see Brooks 140). This park moves northwards from the River Aire through grassy playing fields up to a landscaped area with a long east-west terrace and broad promenade. The central focus of this plan is the Half-Moon Pavilion, intended as a tea-room, which is fully visible at the lower level, and provides a bay off the terrace along the higher level. Two stone staircases curve elegantly up to the top. The ceremony of formally declaring the park open took place on the 25th of July, 1871, in the presence of a large concourse of spectators. The works at Saltaire were stopped a little earlier to give the workpeople an opportunity of being present at the ceremony. When the Volunteers, with their brass band, had entered the park, the gates were thrown open to the public. (Balgarnie 255). In 1903, when Saltaire was owned by Sir James Roberts (1848-1935), a statue of Salt by Francis Derwent Wood was erected on top of the pavilion. Standing just off the promenade, it overlooks the bandstand, gardens and wooded slopes beyond — see main picture for the statue in its setting, glimpsed from below. Saltaire Park, as it was known originally, was later named in memory of Sir James's second son, Bertram Foster Roberts (1876-1912). Sir James was a remarkable man in his own right — the "Bradford millionaire" referred to by T. S. Eliot in The Wasteland (see Holloway). He was born into a struggling farming family near Haworth, where he had met Charlotte Brontë. Having trudged barefoot across the Yorkshire Moors to Saltaire at the age of 12, he taught himself Russian for trading purposes, travelled regularly to Russia for the same reason, and rose to become manager of Saltaire at the ripe old age of 18. He was eventually able to buy the mill-town outright in 1899 ("Saltaire: Conservation," 13). 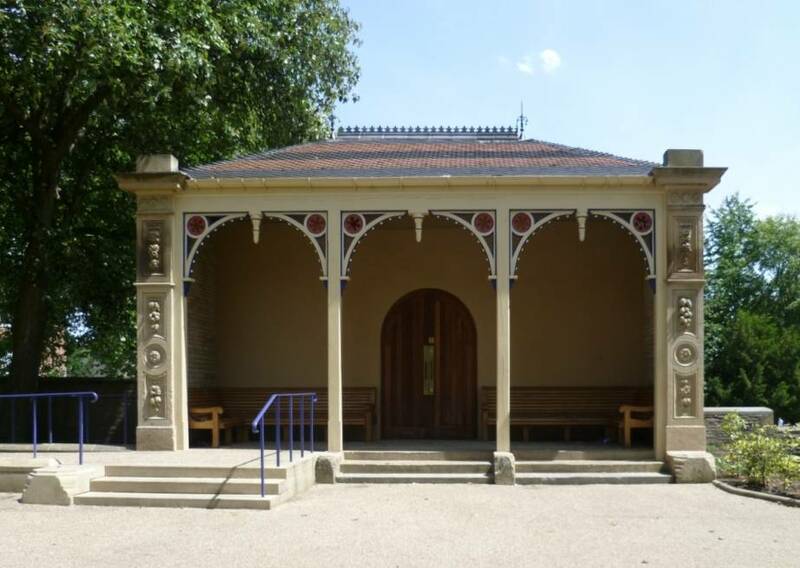 Here, he carried on Sir Titus Salt's ideals and eventually presented the park to the people of Saltaire. 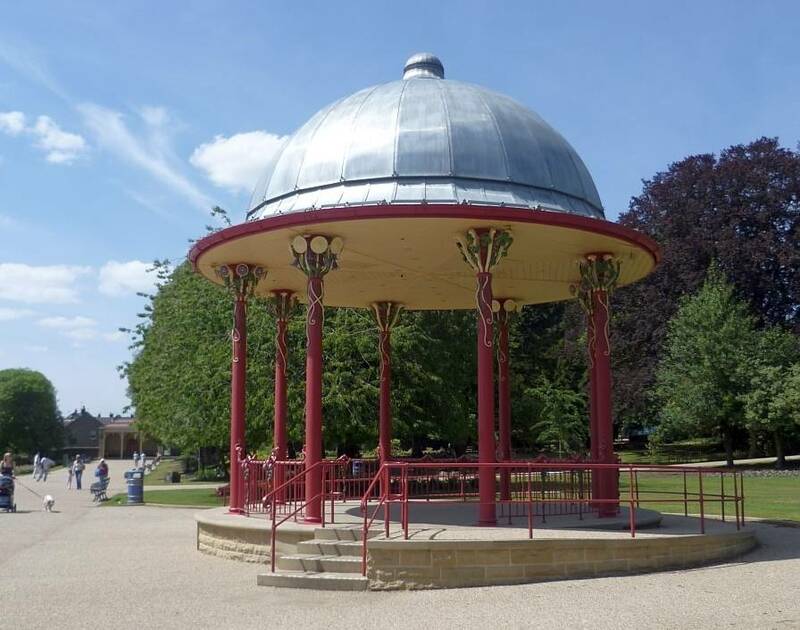 This was reported by The Times of 15 January 1921 in a short notice entitled "Gift of Land to Yorkshire Town": "Recently Sir James Roberts gave Saltaire Park, established 50 years ago by the late Sir Titus Salt, to the Bradford Corporation" (5). By then, Sir James had already been created a baronet (1909), and had been awarded an honorary LL.D by the University of Leeds, where he had established a chair in Russian in 1916. It was also Sir James who in 1928 bought the Brontës' Haworth Parsonage for the nation (see Holloway for many more details of his eventful life). The park has an active support group in "The Friends of Roberts Park." For up-to-date news concerning the park, see the link to their website under "References" below. Balgarnie, Rev.R. Sir Thomas Salt, Baronet: His life and Its Lessons. London: Hodder & Stoughton, 1878. Internet Archive. Web. 9 October 2011. Brooks, Chris. Mortal Remains: The History and Present State of the Victorian and Edwardian Cemetery. London: Wheaton, in association with the Victorian Society, 1989. Friends of Roberts Park. Web. 9 October 2015. "Gift of Land to Yorkshire Town." The Times, 15 Jan. 1921: 5. The Times Digital Archive. Web. 12 October 2011. "The Improved Condition of the Poor." London Society. Vol. 16 (Jan. 1870): 89-91. Internet Archive. Web. 9 October 2011. The Register of Parks and Gardens: Cemeteries. English Heritage. Web. 12 October 2011. 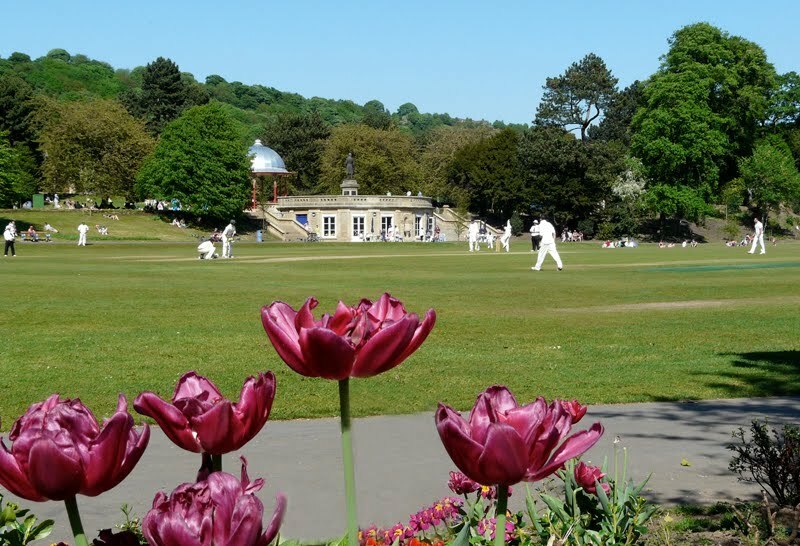 "Roberts Park, Saltaire — A Park for the People." Patrick Parsons, Consulting Engineers. Web. 12 October 2011. Saltaire: Conservation Area Assessment, March 2004. Bradford Metropolitan District Council. Web. 9 October 2011.